If you have some spare time on your hand, rather than doing something inconsequential and simply whiling away your time, it is advisable that you try your hand at picking up a new language. If you are genuinely interested then you will find that, learning a new language is rather easy. When people are thinking of a new foreign language to learn, they usually opt to learn French, not merely because french language is fairly easy to pick up but also because it is a beautiful language which is very pleasing to the ears. If you too wish to learn French language then here are some things to help you along the way. How to Learn French Faster and Efficiently? 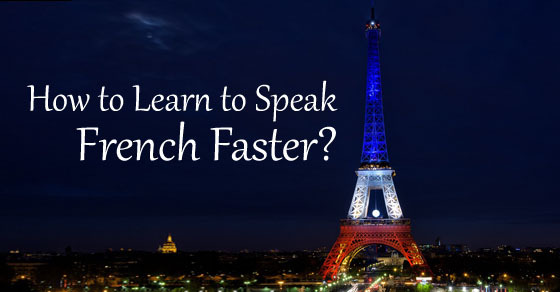 The following mentioned are a few best ways to learn French faster and easily. Before you can think about actually learning a new language, you should know exactly what your exact purpose is for picking up the language. If you are learning French as a hobby, then you can casually learn things at your own pace. Yet on the other hand, if you want to learn French for a distinct purpose then you will really have to keep your head in the game and give your best. If you do not put in your 100% then learning this language quickly will be impossible. So get your priorities straight and ensure that you are serious about this. Once you are absolutely sure about why you would like to pick up the language and are also sure about the fact that you are hell-bent on picking up the language fast, then you should narrow down upon the learning method which is going to suit you best. Gaining this self-awareness will help you tremendously along the way. If you find that you are able to pick up things faster when you write, then you should constantly practice writing, yet if you find that you are someone who says things out loud and remembers it, then that is the method you ought to adopt. It is vital that you decide on whether you would like to be more proficient in reading or writing. Once you know about what you want to do then things will be able to go much faster and you will be able to direct all your energies towards achieving exactly what you want. If you cannot make up your mind about this, then you can always choose to be equally good at both writing as well as reading. You ought to know that you cannot claim to be fluent in a language unless you are able to both read and write in it. Once you have been able to grasp a few things in French you should make it a point to constantly put your knowledge to practice so as to ensure that you do not forget what you have learnt. It is often said that practice makes one perfect so ensure that you donate whatever spare time you have towards revising what you have learnt. Ensure that you do not burden yourself, in your attempt to pick up the language quickly. Take things at your own pace and before you know it, you will be able to speak French without even consciously realizing it. This is indeed a tried and tested method which many people have made use of when they are trying to pick up a new language. What you need to do is make some small pocket-sized flashcards which you can carry around in your purse or briefcase. Have these with you at all times and whenever you find that you are bored or have nothing else to do, you can take out your flash cards and start learning a couple of new words. You should set yourself some definite goals so that you are able to work comprehensively towards achieving them. Try your best to learn at least ten new words every day. If you wish to learn a language quickly then it is advisable that you get a good tuition teacher who will be able to give you some personal attention. There are a number of benefits of being tutored individually, the major benefit is that you will be allowed to go at your own pace and there is absolutely no fear of lagging behind the others. Tuition teachers are rather easy to find, yet when employing ensure that you are hiring someone who is not merely fluent in the language but who is a good teacher as well. Based on how good your teacher is, you will be able to grasp things better. Labelling every possible article in your house, with its French counterpart is most certainly going to be a challenging task, yet you can be sure that this is a foolproof method which will ensure that you pick up the language quickly. If you go out of the way to do your best, then you will soon reap all the benefits of your hard labour. Knowing the French counterparts for words like bed, refrigerator, television, cup, and the cupboard is bound to help you a great deal. Sitting back and leaving things up to your fate is not enough, you must work hard and give your sincere effort. Learning the new words are not merely enough it is very important to know how these words are pronounced. When you hear your tutor speaking, make it a point to keep your ears open. Initially, you might find it hard to embrace the accent and talk in the distinct way in which they speak French, but if you continue to try your hand at it, you too will be able to speak like a Frenchman. In order to help improve your pronunciation, you should carefully watch the manner in which your teacher moves her mouth as well as her tongue. Taking notes of these small things go a long way indeed. At no point in time should you be trying to jump the gun. Don’t be overly ambitious. Go at the pace at which you are comfortable with and do not try to bite off more than you can chew. If you confuse yourself trying to pick up things from way too many sources then you will end up taking very long to learn the language. In order to pick it up fast, just start with the basics and move ahead. It is important to understand the structure of the language and the grammatical principles which the language follows. Do not try and structure your sentences in the same way you structure your sentences in English. Every language is different and it should be dealt with accordingly. One of the best things to do when you are trying to pick up French fast is to read some children’s books which are simplistic. Books for children are not merely easy to read with big print but they often have a number of illustrations which can help you when you are initially trying your hand at reading. There is no shame in doing something like this and this method of picking up a language has proved to be very effective in the past. As long as you know that you are making progress you need not to worry about anything else. The biggest advantage about reading the French translation of the book you love is that since you already know the sequence of events and the manner in which the story begins and ends, reading it is just for practice so as to make you more fluent with proper sentence constructions. The more acquainted you are with French and European culture, the better it is going to be for you. Try and embrace the French culture and go beyond the books. Once you have learnt a bit of the language try and plan a trip to France in order to put into practice all that you have spent your time learning. Listening to French songs is certainly a very good idea as not only is the music beautiful but you can try your hand to understand exactly what a particular song is trying to convey. To help you pick up the language faster you should watch some French movies which have proper English subtitles. If you have the time watch the movies more than once and the second or third time see if you are able to follow what is happening without the help of the subtitles. Your friend can help you learn French faster.To help you get a grasp of the language quickly you should make it a point to befriend someone who speaks French perfectly. If the person is not fluent in the language which you normally speak in, that will be even better. You can help the person learn your language and you, in turn, can pick up a great deal from that individual’s manner of speaking French. When you are trying your hardest to learn French, you should be willing to accept any advice or criticism which comes your way. When someone is saying that your manner of writing a sentence or pronouncing a word is incorrect, you should not be cross and irritated with them, rather you should thank them for helping you and taking the time out to point out your mistake. Take the criticism in the positive sense in which it was intended and do not feel disheartened. The moment you begin to feel bad or lose interest, picking things up from there is not going to be easy. Rather than being in doubt about how far you have come, one of the best things which you can do is take a standardized test in order to see whether you have made any significant progress or not. As you further your knowledge in French the difficulty levels of the test are going to increase as well. So ensure that you do not stop at the first step and continue to move ahead till you are able to speak as well as write in perfect French. Being proficient in the language is bound to help you a great deal in your life and is going to make available a number of opportunities for you. In addition to getting a tutor, you could also consider joining the french speaking course. At such classes, you might not get the personal attention which you would like to go, but you can certainly get to interact with others who are in the same boat as you. In addition to this, having this competition is bound to make you pick up things at an even quicker pace. Having this kind of catalyst is really going to spur you on. French is often referred to as the language of love. It is a soft and delicate language that is pleasing to the senses. When you are well versed in French, it silently communicates that you are someone who has a genuine love for art and culture. Being fluent in a number of languages is not only useful in order to impress people but it also looks great on your CV. Companies are waiting eagerly to employ those candidates who have the knowledge, beyond the conventional bookish knowledge and keeps a close eye on global issues.